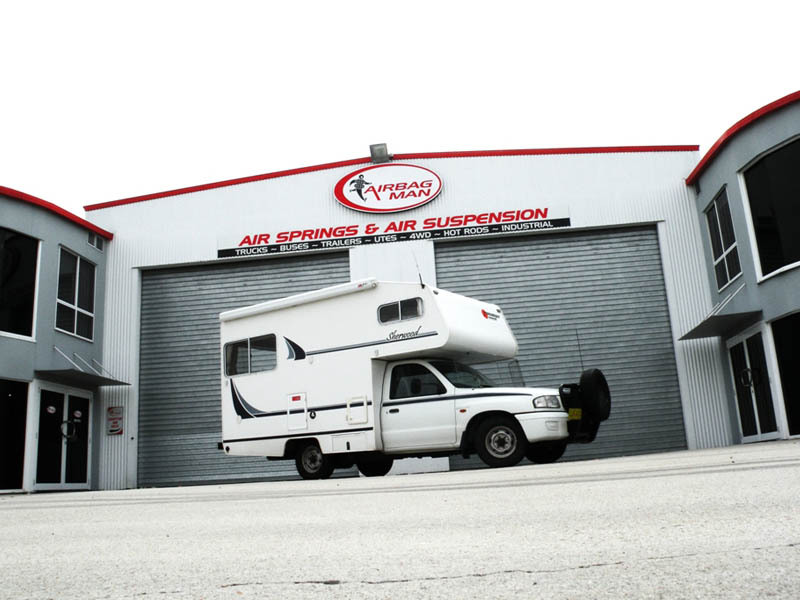 For motorhome owners, when weather and road conditions get tougher, it’s even more noticeable what a difference Airbag Man’s supplementary air suspensions can make to the stability and performance of your vehicle. John McIver is a regular traveller, taking his Mazda Bravo 2.6L Suncamper motorhome from his home in NSW out as far as Western Australia and the Northern Territory. The camper is fitted with Airbag Man’s rear suspension leaf helper kit to help maintain an even vehicle height and reduce wear on the tyres. “I tested a model without the suspension as a comparison and it was nowhere near as stable,” Mr McIver said. “Out on the open roads of WA the speed limits are higher and with the air suspension installed I can easily sit on the maximum speed limit without compromising stability,” he said. 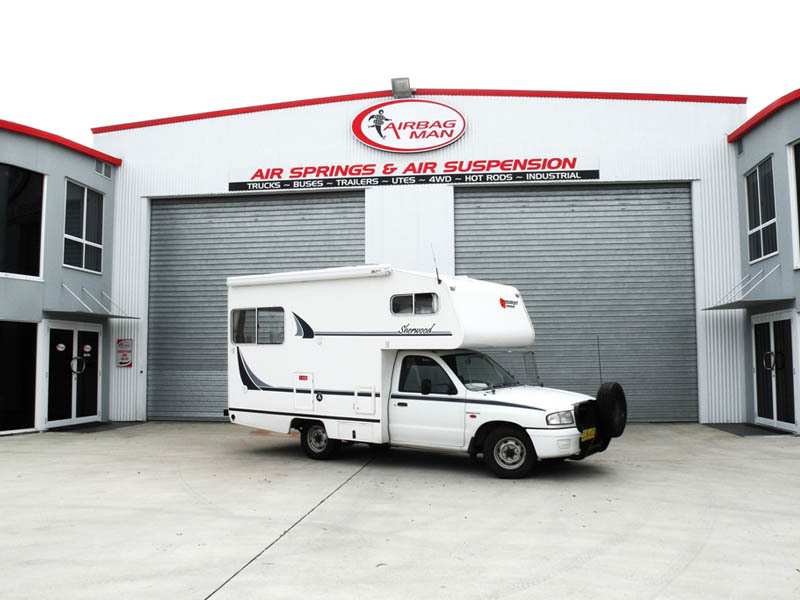 John has owned his Suncamper motorhome since July 2004 and had the air suspension fitted from new and he enthuses about the product and how it has performed. He faced his toughest challenge on a skiing trip in Perisher when a blizzard hit. He drove back to Jindabyne down windy alpine roads and arrived safely, without any rocking and rolling of the vehicle. All snow and ice had been cleared from the road, but the wind was fierce. “It was the hardest I’ve ever been hit by wind. I talked to a local business owner afterwards who said he’s seen semi trailers and tour buses get blown over on that road. If I hadn’t had the airbags, I would have been blown right off the road,” he said. 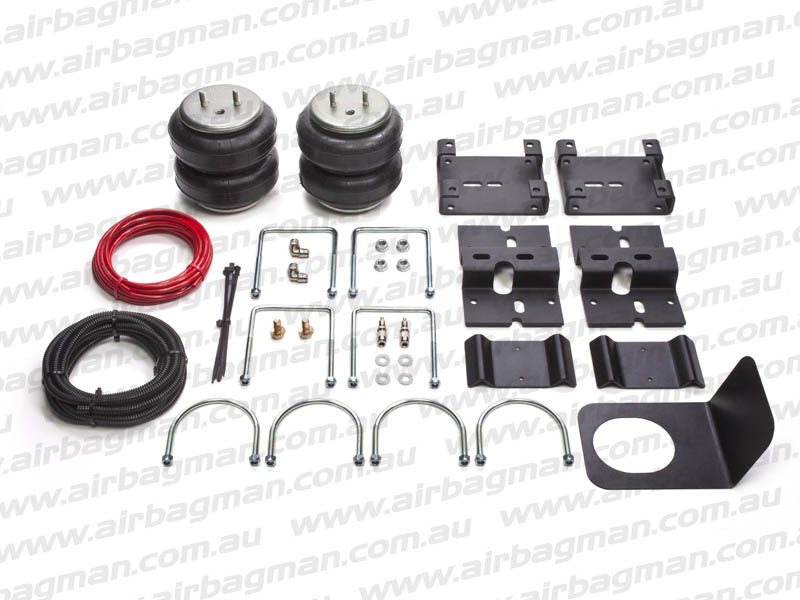 Airbag Man is Australasia’s leading manufacturer and supplier of air suspension products for the commercial, industrial and recreational markets, incorporating high quality airbags from top quality manufacturers such as from the world’s No 1 – Firestone. In addition to pure air suspensions, Airbag Man engineer’s kits for leaf sprung vehicles and kits for coil sprung vehicles. The range encompasses virtually all popular 2wd and 4wd vehicles, light and medium trucks, pickup vehicles, SUVs and vans from Australia, Asia, the US and Europe. Airbag Man Air Suspension Kits – featuring the same type of tough Firestone air springs used underneath semi trailers – fit between vehicle chassis’ and leaf springs to absorb the increasing weight of loads that cause vehicles to sag or lean or produce unstable rocking and rolling. This imbalance can result in hazardous driving conditions and wear and tear on the vehicle’s tyres, suspension and frame. “My camper stands at 3.1m high at the top of the antenna and 6m long, weighing 2.65 tonnes, so it’s quite susceptible to air currents. Sometimes on long open highways you get spots where a pocket of warm air meets a pocket of cold air and vehicles literally get pushed into the next lane. I drove through those conditions riding on air suspension without being moved at all,” Mr McIver said. The Airbag’s work with the existing suspension to re-level loaded vehicles to their ideal configuration, which is with frame and body parallel to the axle, as in an unloaded vehicle. The kits have benefits when the vehicle is loaded or empty, because the air pressure helps take the strain off existing metal springs, preventing sagging and helping them to last longer. Not only are the air suspension kits designed to give better ride and handling, but also their air springs can be inflated to different pressures to cope with uneven loads, varying weights and towing. Many travellers carry toolboxes, generators, batteries, motorcycles or camping materials permanently located on one side or corner of the vehicle, or in a trailer, said Airbag Man. “For me, that fact that I’ve been driving this camper for nearly 10 years and it’s never blown over or felt unstable proves I made the right choice using Airbag Man Air Suspension right from the start,” says Mr McIver.